For those who may not know, I am a children's book lover. I cannot help myself. I adore everything about these books. When Will and I go to Books-A-Million and get separated in our states of perusal, he always knows where I can be found. I will be roaming the aisles of the kid's section. So many colors.. so many characters... to many favorites to name. But today, on the eve of what is supposed to be a huge snowstorm in the Deep South, I am reminded of one of my favorite books of all time. It's an old one, and you probably know it. My mother introduced it to me when I was very young, and I've never forgotten. If you know this book, it probably grabbed your heart right away, and has stayed in your memory as it has in mine. What book am I talking about? 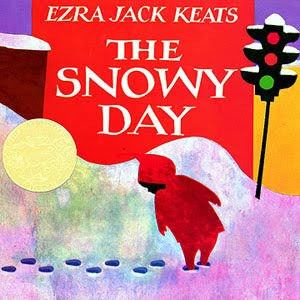 None other than The Snowy Day by Jack Ezra Keats. Just the idea of waking up knowing that the snowy wonder awaits. The sheer excitement of realizing that you can go explore in the world of white. Everything is still when it snows. It's a tranquil, beautiful miracle that we so seldom see in the South. Oh, please please come tomorrow snow! Bring your graceful presence to blanket our sweet city. What a beautiful picture of peace for a city enveloped in so much constant turmoil. Of a day I had rued." Oh I love snow. I so hope it comes! If it does, I'm just going to take a day to rejoice in the Lord's sweet gift of the wintry miracle!